This list was very kindly donated by Peter ( Peter who previously found a shopping list behind an altar). Some Christmas items here including a gift and cranberry sauce. Are the items crossed out ones which were purchased or ones which were not required. 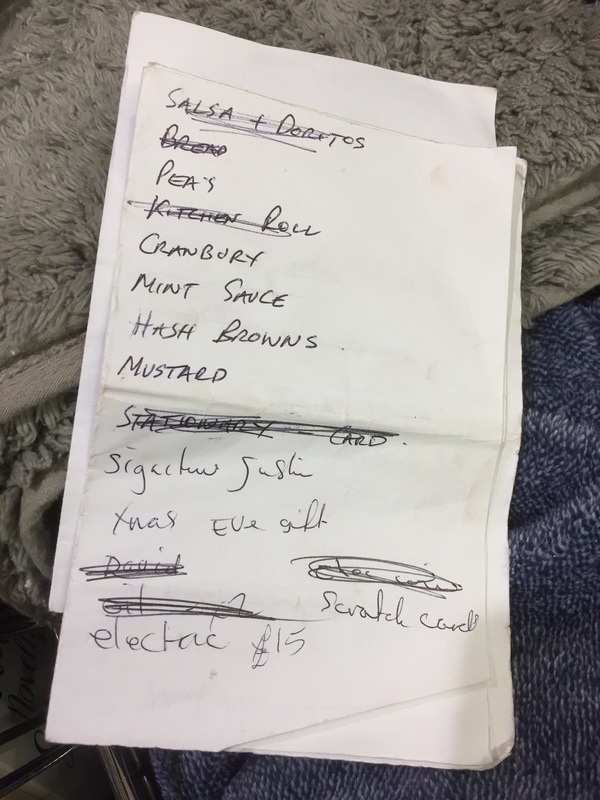 Salsa, doritos, bread, peas, kitchen roll, cranbury, mint sauce, hash browns, mustard, signature fish?, xmas eve gift, scratch card, electric £15. I think that is Signature sushi, does that sound familiar? I love the anglicised spelling – which gives a whole new image to ‘Cranbury Sauce’.